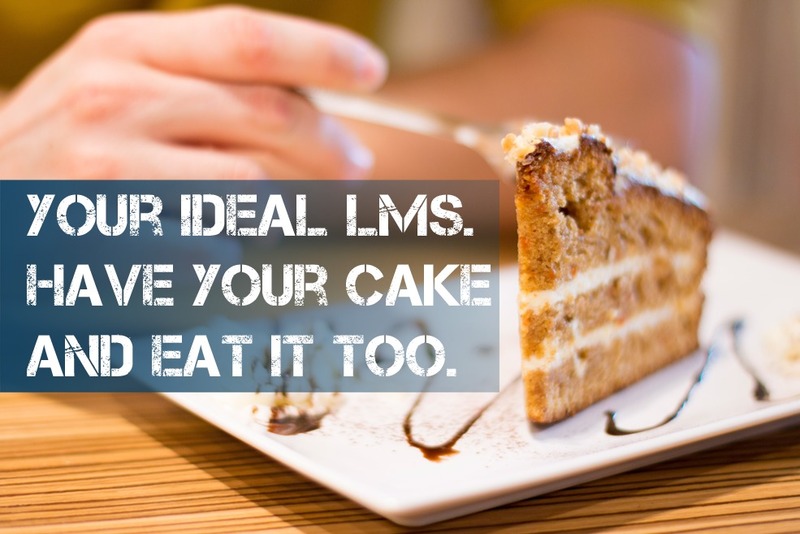 Have your cake and eat it too, a guideline for finding your organization's ideal LMS. Want to deploy and maintain the e-learning that you have spent so much time and effort to develop? Do you want to be able to create quality actionable e-learnings? Then you’re in the market for a Learning Management System (LMS). LMS’s are an essential tool for all e-learning professionals. Choosing a Learning Management System is no easy task. To do so, one must identify the needs of their organization and which features are necessary. If you are the one doing the evaluation of those needs, we recommend creating a team and discussing individual needs on a per department basis to ensure the best possible fit. Confused about which LMS to choose for your project? Then take a deep breath and exhale a sigh of relief! Allow us to offer you some helpful tips that will surely point you in the right direction for selecting the perfect LMS for your project. Be sure to methodically ask yourself this set of questions before choosing an LMS: What are your development objectives? What skill-sets are required? What sort of content are the learners expecting? Answering these questions will help you shape the correct direction for your organization to meet all of its learning and development needs. Most importantly keep the need of the audience in mind throughout the selection process. To accomplish this all you need to do is perform a little internal research. An analysis through an in-depth survey accompanied by a few short one-on-one interviews with the projected user base and decision makers within the organization can aid tremendously. In this search for information, it is vital to focus on the objectives you want to achieve by the e-learning courses or training. Outside of these answers, there is one more thing that you will definitely need to know. Any guesses? How about, will it work within your pre-existent learning environment? Always check the technical specifications available for a new LMS and its ability to address the goals of your learner needs. There is a veritable ocean full of features to choose from. In order to not get “lost at sea,” you must pick the features your organization needs. It might be quite difficult to choose the most pertinent features available because there are so many features; narrowing the list down can cause a hell of a lot of confusion. Identifying features you need is the most important step in choosing an LMS, as it will allow you to shortlist the solutions that will create the most effective e-learning course for your audience. Let’s look at an example for better understanding. If you are catering to learners who are busy on-the-go professionals then opting for an LMS that supports mobile is ideal. When you choose a new LMS you need to know how the new learning system will be integrated with your current software. Will there be issues to integrate divergent systems or different types of systems? Other than different software, it is very important to know how your learners will access the content. Will a majority of the content be viewed via mobile? Tablet? Or PC? How well does the new LMS support these platforms? Do your research, if your learners are tech savvy and accustomed to utilizing these features or are constantly attached to their mobile devices, these environments will need to be accommodated. This factor will determine nature of e-learning activities as well as the level of multimedia integration. Ask your instructors and facilitators their honest feedback about your current training strategy. Ask them if they think there are new features they wish to investigate or if there are any new tools or materials they may find beneficial to ease their jobs and make training more pertinent to your employees. The purpose of this feedback is that they are the ones who help learners take full advantage of the overall organizational strategy. The cherry on top of the cake will be if they know their ideas and opinions are valued entering into a new LMS environment, they will feel more invested in the selected system. As an organization, it is imperative to forecast for the future of your operations. So why not lend the same consideration towards your LMS? Your system might be wonderful today, but what about tomorrow? Be sure to obtain a clear sense of how your Learning Management System will adapt to current as well as upcoming needs during live demos and trial runs. Ideally, you want to choose an LMS that is going to offer you the features and functionality you need now and in the future. Knowing that your system is easy to maintain and update over time, can save you a lot of heartache as the demands of your department shift. In modern business, we are afforded the ability to check and double check before selecting a product or service. Almost all LMS vendors will provide a demo or trial period for testing their product before your purchase. Do not hesitate to ask for a live demonstration or trial period that will allow you to see your potential LMS in action. Demos are very beneficial as you will be able to see which features are really worth your time and which are unnecessary or cumbersome in their environment. A trial will help you measure many factors like flexibility, customization, growth, and usability! An LMS is one of the most significant investments in terms of potential outcome for your company, so it's always wise to have a test drive! These tips will surely aid in your quest for the perfect LMS; one that is right for your learning and development and creating an ideal user experience.